Amitabh appeared to have been pitted against his wife Jaya and Deepika on the dance-off. Deepika Padukone and Ranveer Singh’s wedding reception in Mumbai was a grand affair, with a host of stars from Bollywood in attendance. Among the celebrities who attended were Amitabh Bachchan, his wife Jaya, daughter Shweta Bachchan and daughter in-law Aishwarya Rai Bachchan. The megastar gave competition to Ranveer on the dance floor, and in one instance he even went up against Deepika and his wife Jaya. Amitabh posted some of the pictures from the evening on his Instagram page and one picture in particular caught our eye. In it, he could be seen standing on one side with Ranveer while his wife was on the other side with Deepika. From the caption he put up for it, it appears to have been a competition between boys and girls. He also mentioned actress Vidya Balan and her husband who were standing to the side watching the competition. “It’s the girls vs the boys at Deepika-Ranveer wedding bash .. and the girls are winning.. the reactions of Vidya and Hubby and Arshad are proof,” he wrote in the caption. He followed the picture with another where he is seen hugging Ranveer as they both accepted their defeat gracefully. 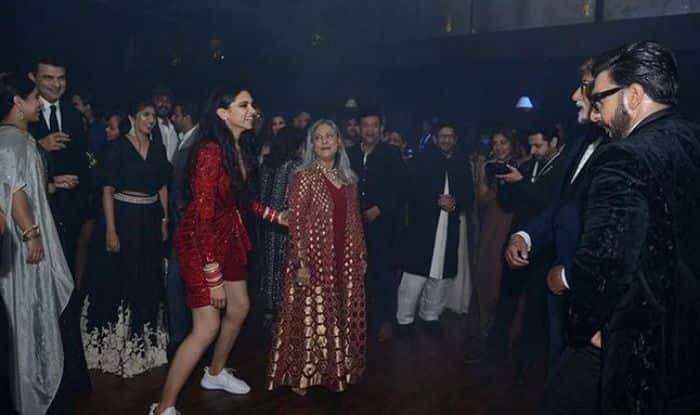 It appeared to have been a fun filled evening for the stars, with a lot of dancing and singing, so much so that even Deepika was spotted changing into sneakers as they danced the night away.